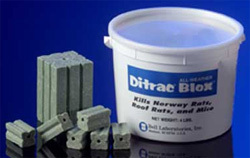 DITRAC All-Weather BLOX is an extruded rat and mouse bait that gets excellent control indoors and out. Its active ingredient, Diphacinone, makes DITRAC All-Weather BLOX an excellent maintenance bait. DITRAC All-Weather BLOX is formulated by a unique extrusion process that yields a highly palatable and weatherable bait. Made with the optimal blend of food-grade ingredients and paraffin, DITRAC All-Weather BLOX stays fresh and palatable in wet and dry areas. DITRAC's patented X-shape design gives rodents plenty of edges to gnaw. This increased gnawing area, coupled with the special blend of ingredients, results in a bait that gets superior acceptance in all baiting situations. DITRAC is colored green and authorized by USDA for use in federally inspected meat and poultry plants. Baiting is easy and clean with ready-to-use DITRAC All-Weather BLOX. The 1-oz. bait pieces fit easily into burrows, bait stations and tight baiting places. A quarter-inch hole through the center of the block lets you nail or wire the bait into place. When placing DITRAC be sure to place them out of reach of children & pets. DITRAC causes rodents to seek out a source of water, forcing them outdoors.